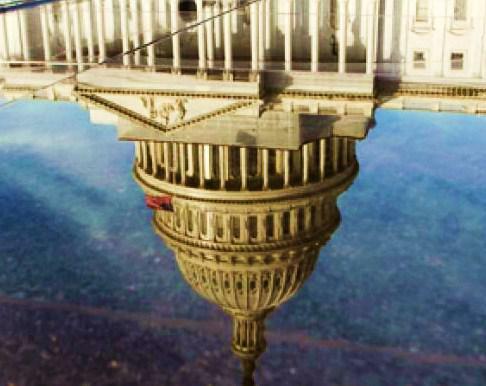 Payback has created a situation that is as upside down today as this reflection of the Capital, which symbolizes just how critical the failures of this government have been, since the new millennium began. When this place was small and just beginning, there was even then an expectation of being able to manage our affairs with a minimum of lies: All of that has been completely reversed—because today everyone and every-authority does almost nothing but lie, about everything they say or do. In the ancient world of commerce: Products and businesses were maintained by competition, by quality and by reputations which created their own demands; in a world where monetary profits were only one small part of everything to do with markets, or with the living of any life. “Trust” was a necessary commodity and one’s reputation mattered tremendously. Not so any longer. When values had specific qualifications, life was much easier to navigate through. By the time the USA became a fledgling state, we were already committed to slavery and enslavement as a natural part of commerce—just as the early Americans had adopted the lie of “Manifest Destiny” as our excuse to rule the hemisphere if not the world. By keeping and expanding slavery as part of commerce, we greatly influenced the imbalance between the cost of anyone’s goods or services and the rate of the profit margins thus expanded. In truth we have not deviated from that original concept, we just no longer call it slavery. While this duality began our rise as a nation through the global success of our cotton and tobacco products, we never measured the social costs of that short-cut to increasing profits far-beyond their natural limits—by paying almost zero for slave labor. This inherent lie has led directly to an entire world (Thanks to the administrations of both Bush & Obama) that is now made-up only of lies. This was only possible because commerce & the money-changers have eliminated the people from any and all equations that might have had to deal with a fair-share of any undertaking, for those that actually create the wealth—everywhere! T he “consequences” for living as we have chosen to live, since we entered the new millennium has consequences for everyone alive today. “Justice applies to the society of the world. 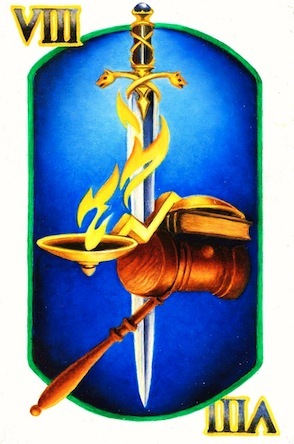 Her sword bisects both the scales and the gavel because we are the flaming-blade that is caught between the laws, as written, and the scales of justice that should apply to everyone in all societies. The truth is that laws are only words on paper, until the people affected back-up those laws, with blood. “The general public of the USA has refused to accept any responsibility for anything and everything of note that has happened since the dawning of the year 2000. RESPONSIBILITY demands the CONSEQUENCES that we have earned and must now begin to deal with. This is not a matter of choice, because it’s part of the natural law that defines the balance needed in the universe. And in this instance, nature will be merciless in her PAYBACK for what we have done, whether by commission or omission, as well as what we continue to do to her. When there were laws on this earth, there was an expectation that people were entitled to be able to deal with each other openly and honestly. When those terms were violated, and SECRECY took up a self-appointed mantle of global-power, then there had to be consequences for the failure of all who have violated all the accepted laws. Today there are no longer any laws—but this cannot continue no matter how criminally-dominated the world becomes! Are the inescapable result of the world gone mad. In many new ways the world is fighting back, at last. But the question remains—will it be enough and can it happen in time to avert the nightmare? “There is one species though that kills and hordes more than it needs for its own survival: humans. How many millions do you need for you and your children never ever having to worry about money? 5 million? 25 million? 50 million? So why do people who are already that rich keep chasing more money? Even after 100 million, 500 million, 1 billion they still want to horde more. And of course there’s more! “Using a zero tolerance approach to track domestic terrorists online is the only reasonable way to analyze online threats these days, especially after the Boston Marathon bombing and news that the suspects had subsequently planned to target Times Square in Manhattan, Mullins says. The way law enforcement agencies approach online activity that appears sinister is this: “If you’re not a terrorist, if you’re not a threat, prove it,” he says. "Zero tolerance" is never "reasonable." It never has been and it never will be. In fact, it's the polar opposite. Zero tolerance policies simply absolve the enforcers of any responsibility for the outcome and grant them the privilege of ignoring mitigating factors. It allows them to bypass applying any sort of critical thinking skills (the "reason" part of "reasonable") and view every infractions as nothing more than a binary IF THEN equation. …Believe it or not, Mullins is not done talking. What he says next doubles up on the "dangerous" and "stupid." This is the price Mullins is charging to live in the NYPD's severely stunted version of a "free" society. The NYPD has been harassing young minorities at the rate of 500,000 impromptu stop-and-frisks per year for the better part of the last decade. For the past 10 years, the NYPD has been regularly trampling citizens' civil liberties simply because they attend a mosque. The NYPD and Mayor Bloomberg have worked ceaselessly to make New York the most-surveilled city in the U.S. If we cannot deal with society because it has become the worst-criminal-among-us: Then we must take power away from the OUTLAWS and restore the balance between people at home and abroad; by responding the laws that have been violated both nationally and internationally ­ and for that we do not need “permission” from the same Outlaws that appointed themselves to rule over the entire planet.